I’ve already mentioned in a few recent posts that this day was approaching. The one year birthday, or as some call it “blogiversary”, of my Yankee Doodle Paddy home. I am so excited and also overwhelmed with emotion. But later today there will be a free give away competition to celebrate over on my Snapchat account (username: blissbakery). I just wanted to share with you a few of the top posts of the year. Because in these 365 days this is the 222nd post! So for many that might have just started on the journey it would be hard to catch up. And for those who have been here from the start, it might be good to look back at a few posts that have resonated with you in some way or another. Obviously, this is categorized as a “foodie” blog because I am a chef and post recipes. But I also share stories of my years working in Hollywood as an actress, as well as stories from my childhood and divorce that were very traumatic. Not to moan on about them, but to let others know I can relate to their struggles and to open up some conversation about very real and human issues. Sharing stories is a beautiful way for our souls to connect. It allows us to support and encourage each other in this earthy existence. Soul Dog– Most people seem to have had a dog at some point in their lives. If not they have had a cat or some other pet that has touched their hearts. Jack was one of many pets in my life. But he stole my heart. And when he passed it left a hole. It is still there and that’s okay. Because it is a reminder of just how much another (even an animal) can enter into our lives and make it better! If you haven’t read this one, make sure to have some tissues at hand. Not because of my particular story with Jack. But because you will have a beautiful cathartic experience thinking about your own special creature that has stolen your heart. It is good sometimes to have a cry. It’s a beautiful reminder we are indeed alive! 2. Peanut Butter in the Pocket– My obsession with peanut butter is well documented. But not only will you have a chuckle at my love letter to peanut butter, but also be surprised to know I was once a thief! But there is the most amazing recipe for chocolate peanut butter bars. You have my permission to skip the story and go straight to drooling over these delish treats! 3. The Dog Ate the Pot Brownies– Another dog story true, but a different dog. Only this one is a unique because it features one of the episodes that relates to my mom being a drug dealer. But there is actually a delicious recipe for sweet potato brownies. Totally sugar and gluten free and no worries about a drug bust if you make them! 4.Spaghetti Sticks and Mayonnaise– People have said for years I should write a book. There are many unbelievable but true stories in my 51 years of life, but as a chef a cookery book is more up my alley. If that ever happens I wouldn’t mind this blog post’s name being the title. True, it is an unusual name for a cookery book. But when you read this short post (which was early days of the blog) you’ll see why cooking has been so important to me. I might not have been old enough to read the package instructions to cook the spaghetti at the time. But I’ll never forget the taste of spaghetti sticks dipped in mayonnaise. 5. Head Banging Tiramisu– Since tonight I’ll be doing the give away as I mentioned above, I thought I would share the first give away I ever did for Snapchat. But it is really the story around it that is so, well, so me. I am the world’s biggest klutz. And this story is from my early days of snapping, when I nearly killed myself. I thought it might give you a chuckle to read this cracking story! 6. Jagged Little Pills– So many people I meet are surprised to know I dealt with depression. I am such a happy person so how could that be? Well if you read this post you will understand. And I think you might find that it isn’t so hard to talk about a natural human response to grief or a chemical malfunction in our brain. It actually takes more work and energy to hide it. 7. Mancrush Monday in the Morning– If you are as much of a Marty in the Morning fan as I am, then you’ll love this post. If you like delicious cookies, then you’ll love it too. There’s a great cookie recipe and an even better love story for the nicest man I have never met! But please God some day I will. Yep it is on my bucket list! 8. Tripidation: Serve– Finally, I had to add one of the posts from our trip to Africa. I did a whole week long series of reflections in fact and received so many amazing comments I could have listed any of the posts on here. But for me, this one sums it up. Because in reality, we all need to be of some sort of service in our lives. Whether at home, work or the community. Humans need to have a life of purpose in order to be fulfilled. And while I was once a guest contributor to a blog, I haven’t officially had one on here. However, in this particular post , the majority of the text and all of the photos were actually done by my Hubby. Since my blogging and snapping and all of this wouldn’t be possible without his unfailing support, I hope you read this one if you read any of these listed. He is my rock and I am so grateful to be his wife. So there you have it! 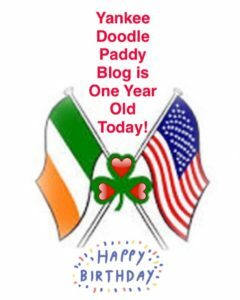 Eight posts from a year in the life of Yankee Doodle Paddy. Please God there will be many more fun times, fab adventures, and yummy recipes to come. Most of all I hope we can continue this experience together. I don’t like to use the term “my followers” as I have mentioned previously. That would imply I am the leader, walking in front with my back to you. I am possibly a tour guide at times. But I prefer to think of us as family. We are in it together, holding hands, side by side!